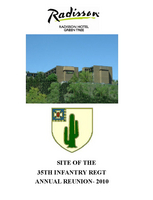 Rad-Pitts.jpgBeautiful Hotel on the hillHotel sits atop a high, picturesque bluff and serves as the home of the 12th Annual 35th Infantry Regiment Reunion. Y'all come on in! 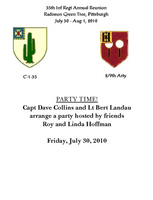 Reunion_Party.jpgFriday Night BashThe members of C-1-35 and the 2/9th have begun a tradition of a "unit party" similar to those held by other line companies. Hosted by Roy & Linda Hoffman in their magnificent home in Zelinople, PA.
2010-Pitts.jpgTelling war storiesCapt Dave Collins & Jerry Walling (C-1-35) listen intently as Diane Kammerer, wife of deceased 2/9th Arty FO Lt Tom Kammerer, tells her story. 2010-Pitts2.JPGChatting away(at table) Greg Malnar with Linda & Dickie Dickerson. Standing is Ed Moor, 2/9th FDC. 2010-Pitts3.JPGTasting the goodiesJim Beddingfield takes a big bite next to wife Linda. Host Roy Hoffman stands behind the bar. 2010-Pitts5.JPGAnother "First Timer"Ed Moor displays his new "Arty Shirt" while chatting with Cacti Reunion veteran Dennis Munden who is also wearing his "Arty Shirt". 2010-Pitts4.JPG"We're open till 1am. 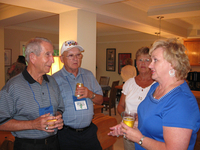 "Host Roy Hoffman chatting with Linda & Jim Beddingfield. 2010-Pitts6.JPG"No, I don't care about Jenny Craig"Good ol' buddies Lt Gary Dean Springer and Lt Bert Landau chat on the porch. 2010-Pitts7.JPGNon-alcoholic beverageEd Moor enjoys a cold Sprite. 2010-Pitts8.JPG"Thank You Very Much"Dave Collins serves as Emcee thanking hosts Roy & Linda Hoffman. Tom Roman and Byron Kurtgis, brother of FO Mike Kurtgis look on. 2010-Pitts9.JPGCat's MeowMaj Jerry Orr pictured in his Arty Shirt standing next to "first timer" Lt John Cashin. 2010-Pitts10.JPGWatching the showTom Roman, Byron Kurtgis, wife Lisa, and Ernest Correia observe Dave Collins serving as master of ceremonies.